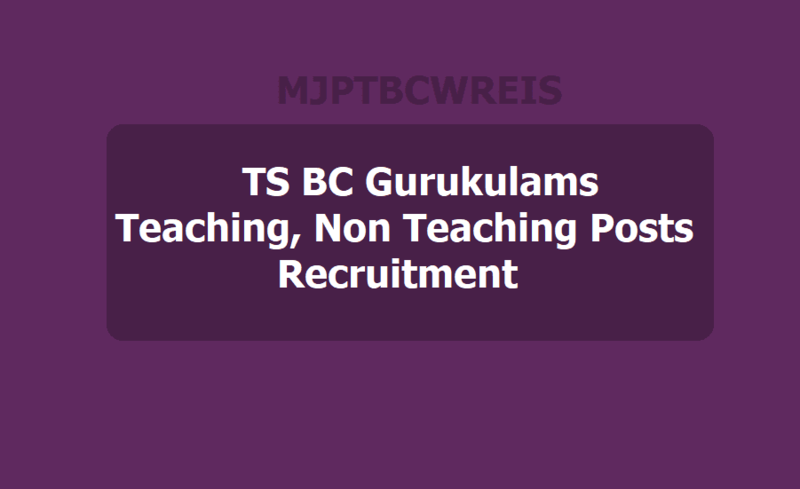 TS BC Gurukulams Teaching, Non Teaching posts Recruitment under MJPTBCWREIS 2019. TS to fill 3689 posts in 119 new MJP BC Welfare Residential Schools under MJPTBCWREIS. TS MJP BC Residential Schools Teaching, Non Teaching Posts Recruitment, TS BC Gurukulams Teaching, Non Teaching Posts Recruitment, TS MJPBCWREIS Institutions Recruitment, Principal, JLs, PGTs, TGTs, PDs, PETs, Librarian, Craft/ Art/ Music Instructor, Staff Nurse, Senior Assistant posts sanctioned in Backward Classes Welfare Residential Schools. Backward Classes Welfare Department - Sanction of posts in one hundred and nineteen (119) new Backward Classes Welfare Residential Schools under Mahatma Jyothibha Phule Telangana Backward Classes Welfare Residential Educational Institutions Society (MJPTBCWREIS) and Head Office (MJPTBCWREI Society) - Orders - Issued. 1. G.O.Ms.No.18, Backward Classes Welfare (B) Department, dated:04.08.2018. 2. B.C. Welfare (B) Department,U.O.No.941/B/A2/2018, dt.22.12.2018. In the reference 1st read above, Government accorded administrative sanction for establishment of one hundred and nineteen (119) new Backward Classes Welfare Residential Schools in the State. 2. In the reference 2nd read above, the Backward Classes Welfare Department have proposed creation of teaching and non-teaching posts in the newly established one hundred and nineteen (119) new Backward Classes Welfare Residential Schools. 4. Permission also hereby accorded to outsource the functions of Sweeping, Sanitation, Cooking & Security in terms of the orders issued G.O.Rt.No.2246, Finance (SMPC) Department, dt:07.06.2007, subject to budget provision. 5. The Backward Classes Welfare Department shall obtain concurrence of Finance (HRM) Department before initiating measures to fill up the posts sanctioned in this order, wherever service rules prescribe direct recruitment. 6. The Backward Classes Welfare Department is requested to take necessary further action in the matter accordingly. Govt Of TS, BC Welfare Department - Sanction of posts in one hundred and nineteen (119) Backward Classes Welfare Residential Schools under Mahatma Jyothibha Phule Telangana Backward Classes Welfare Residential Educational Institutions Society (MJPTBCWREIS) - Orders - Issued. 2. B.C. Welfare Department, U.O.No.1881/B/2016, dt.20.10.2016. In the reference 1st read above, Government accorded administrative sanction for establishment of one hundred and nineteen (119) Backward Classes Welfare Residential Schools in the State. 2. In the reference 2nd read above, the Backward Classes Welfare Department have proposed creation of teaching and non-teaching posts in the newly established one hundred and nineteen (119) Backward Classes Welfare Residential Schools. 4. The Backward Classes Welfare Department shall obtain concurrence of Finance (HRM) Department before initiating measures to fill up the posts sanctioned in this order, wherever service rules prescribe direct recruitment. 5. The Backward Classes Welfare Department is requested to take necessary further action in the matter accordingly. Backward Classes Welfare Department - Sanction of (119) Backward Classes Welfare Residential Schools - Orders - issued. The Government of Telangana is taking several measures for the Social, Educational and Economic growth of Backward Classes in the State. In order to provide better and quality education to the children belonging to Backward Classes, the State Government felt that there is a need for opening more number of Residential Schools for Backward Classes in different parts of the State. 2. Government after careful examination of the matter have decided to establish (119) Residential Schools for the Backward Classes in the state from the academic year 2017-18. Accordingly, administrative sanction is hereby accorded for establishment (119) new Residential Schools for the Backward Classes in the State from the academic year 2017-18. 3. The Secretary, MJPTBCWREIS, Hyderabad shall take necessary action to identify suitable locations for establishment of above said schools and send proposals to the Government at the earliest. 4. The orders for sanction of Teaching and Non-teaching staff will be issued separately by the Finance (HRM-II) Department.